Not all snakes that are found in the Phoenix area are the deadly kind. Still, when encountering a snake you should take appropriate precautions. If you come upon any snake in the desert, the best way to proceed is to steer clear — avoid it and leave it alone. If you find a snake inside your home or in your yard and you aren't comfortable with what kind of snake it is or how to handle it, contact a professional and they will remove it for you. The images in this gallery feature snake varieties that can be found in Arizona. To learn more about snakes that are found in Central Arizona, try a field guide to amphibians and reptiles of Maricopa County. The venomous Arizona black rattlesnake (Crotalus cerberus) is a medium to large rattlesnake that probably won't be seen right in Phoenix but in the higher elevations of Maricopa County. The venom is dangerous. The venomous Arizona coral snake (Micruroides euryxanthus) is also called the Sonoran coral snake. It's a small snake, related to the cobra, and can be found in the Phoenix desert. The neurotoxic venom can be very dangerous. Avoid this snake! The nonvenomous black-necked gartersnake (Thamnophis cyrtopsis) is from 3 to 4 feet long and is found in central and eastern Maricopa County. Mostly active during the day or on warm nights. The venomous black-tailed rattlesnake (Crotalus molossus) is a large rattler with harmful venom. It can get to about 4 feet long. The tail is black, which is how you can differentiate it from the Western diamondback rattlesnake. It's a ground-dwelling pit-viper. The nonvenomous bull snake is commonly found in Maricopa County. The nonvenomous California kingsnake is commonly found in Maricopa County. The common kingsnake (Lampropeltis getula) is a large (4-5 feet) nonvenomous snake found throughout Arizona. It is a ground dweller and a constrictor. The glossy snake (Arizona elegans) is a nonvenomous snake found in much of Maricopa County. It is nocturnal and spends most of its time underground. The nonvenomous gopher snake (Pituophis catenifer) can get to 7 or 8 feet long. It is a constrictor that is active most of the time, except when it gets cold. It can climb and is often mistaken for a rattlesnake. The mildly venomous ground snake (Sonora semiannulata) is a small snake that can be seen in a variety of colors, at home in most parts of Maricopa County. It is active day and night, but mostly nocturnal during the hottest parts of the year. The nonvenomous long-nosed snake (Rhinocheilus lecontei) is a nocturnal snake found over most of Maricopa County. It hibernates in colder weather. The venomous Mohave rattlesnake (Crotalus scutulatus) is found over most of Maricopa County on level terrain. It's a pit-viper, using heat-sensing pits to detect warm-blooded predators and prey. That means you, so stay away. The mildly venomous night snake (Hypsiglena torquata) is a small gray or tan snake of up to 2 feet long. It is found in most parts of Arizona, including Maricopa County. It is nocturnal and rarely strikes. Adult red coachwhip or red racer snakes bite and are best not to be handled. The mildly venomous ring-necked snake (Diadophis punctatus) is a small to medium-sized snake. In Arizona, it might not have the neck ring. It is active during the day and hibernates in the colder months. The nonvenomous rosy boa (Lichanura trivirgata) has either reddish-brown or black stripes alternating with a cream color. It likes hillsides and rocky habitats. This is a slow-moving constrictor and is a ground dweller. The sidewinder (Crotalus cerastes) is a venomous snake found in much of Maricopa County. It is usually small (2 feet in length) and is tan or cream-colored. The nonvenomous Sonoran mountain kingsnake (Lampropeltis pyromelana) is active during the day, and sometimes at night. Not necessarily found right in Phoenix, look for these in the higher elevations of Maricopa County. The nonvenomous Sonoran whip snake (Masticophis bilineatus) is very fast and will climb in and even sleep in trees. It likes canyons, foothills, and rocky slopes. The venomous speckled rattlesnake (Crotalus mitchellii) comes in a variety of colors and its habitat includes most of Maricopa County. It's a ground dweller and most active in the spring. Venom is potent. The nonvenomous spotted leaf-nosed snake (Phyllorhynchus decurtatus) is a small snake found over much of Maricopa County. It is a nocturnal ground dweller that burrows and stays under soil much of the time. The venomous striped whip snake (​Masticophis taeniatus) is found in the northwesternmost part of Maricopa County, so you shouldn't find them right in Phoenix. It's a long, thin snake. It's fast, hunts with its head off the ground, and it can climb trees. The venomous tiger rattlesnake (Crotalus tigris) can be an orange-brown color, like this one, or blue-gray. It's a medium-sized snake. It is found in Maricopa County up to an elevation of about 5,000 feet. It likes rocky habitats. 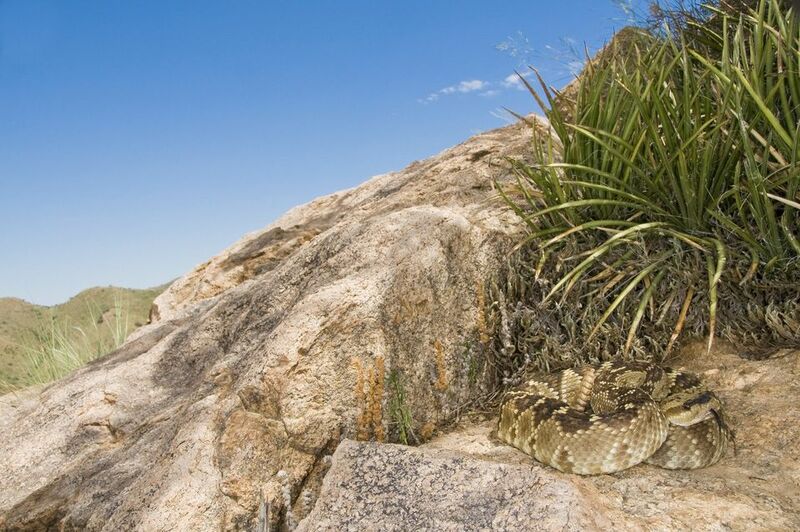 The venomous Western diamondback rattlesnake is commonly found in Maricopa County. The mildly venomous Western lyre snake (Trimorphodon biscutatus) is found over much of central and southern Arizona. It likes rocks and steep slopes. Capable of climbing, it usually stays on the ground and is mostly nocturnal. The nonvenomous Western patch-nosed snake (Salvadora hexalepis) is a fast mover, found all over Maricopa County. It is active in the daytime. It usually stays on the ground but is capable of climbing. The mildly venomous Western shovel-nosed snake (Chionactis occipitalis) is a small snake of up to 15 inches. It spends most of its time under sand or in sandy soil. The venom of the Western shovel-nosed snake is usually not especially dangerous. The mildly venomous variable sand snake (Chilomeniscus stramineus) is a small snake found across central Arizona. It is mostly, but not strictly, nocturnal.